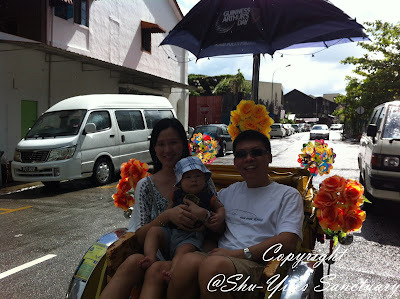 After bringing Shern to sit the Rapid Penang Bus, I'd promised him to bring him to sit the trishaw. 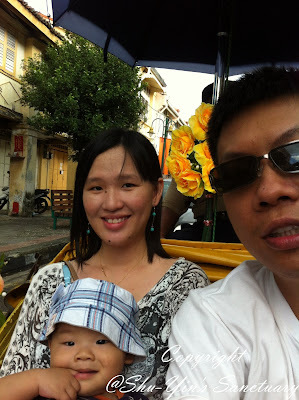 But I'd been busy with CNY and Wen and her SA family came for visit, so my promise to him had taken a back seat. Now with Shern having school hols, it was time to bring both my kiddos for a ride on a trishaw. When I was small, I lived right at the heart of Georgetown with my Pho-pho. And I followed her to the morning market all the time. Quite often, we took the trishaw back to home from the market, especially when my Pho-pho had a whole bag of market goods to lug home. 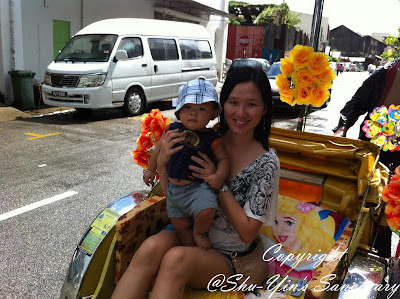 And I always enjoyed the ride home on a trishaw. That was when I was about 10 years old. 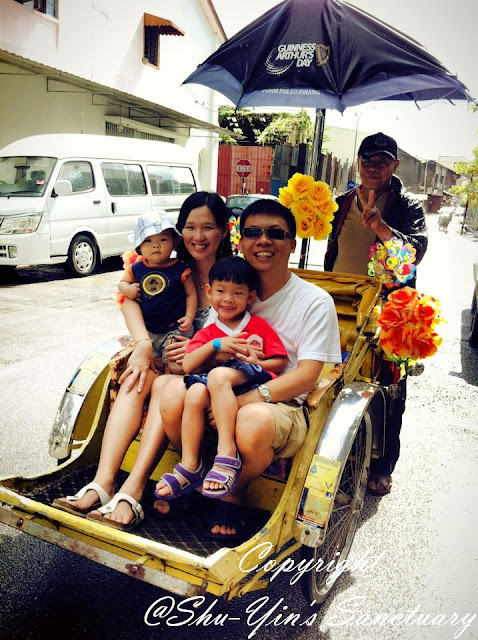 Fast forward 20 years, there is now much more cars compared to then and sitting on a trishaw on the road full of fast vehicles is really dangerous. So we decided to go to the Heritage areas on a Sunday morning, where there will be less traffic. So 4 of us, together with Min drove down town on Sunday morning. 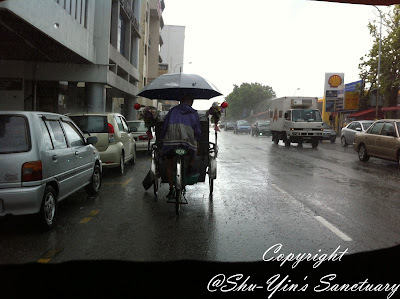 As we approached a trishaw man, we saw grey clouds started to fill the sky. 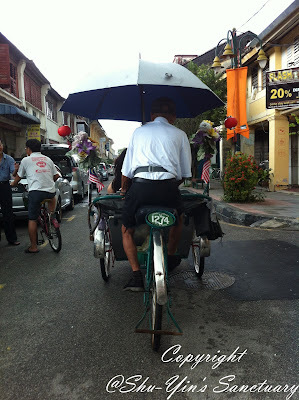 I believed it should be about RM10 for a short 10-15 mins ride. 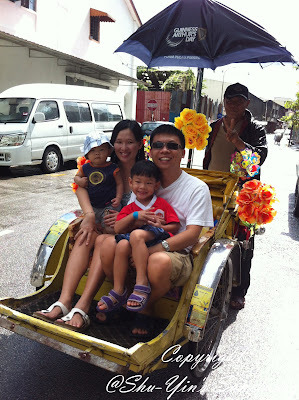 We needed 2 trishaws to accomodate us all, but one old uncle said he wanted RM30. We kinda knew it was a rip-off, but then it was beginning to drizzle and as the uncle was really old, hubby said ok and to think of it as a charity to an almost-dying trade. lol. 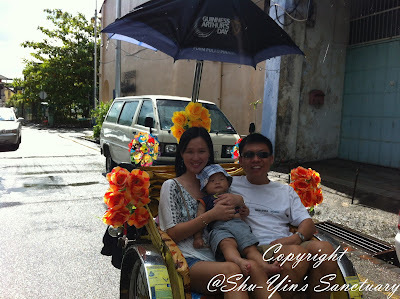 And so Shern and Min on one trishaw, while hubby, Khye and me on another. Some of the self-taken photos using my trusty iPhone, with Khye on my lap. 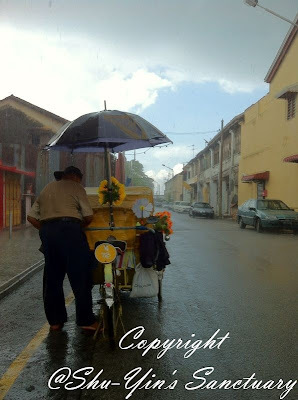 And not even 2 minutes into the ride, it started to rain, and the rain got heavier, and luckily our trishaw man was all prepared. Put 2 planks on the sides of the seat, and gave us a protective sheet to cover the front part. We were very well shaded all around us. 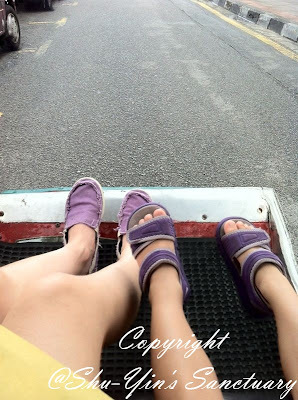 This was our view from inside the trishaw. Still got a view and still well shaded. Very impressed. 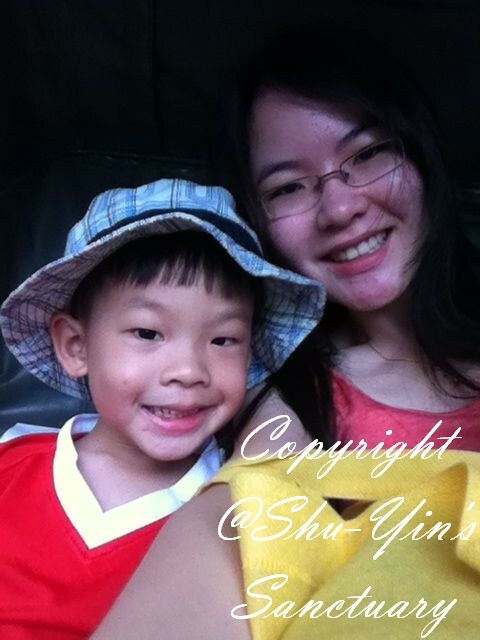 Some photos of me and my cutie pie. Shern on another trishaw was having a great time with his Yee-yee. They took photos of themselves. 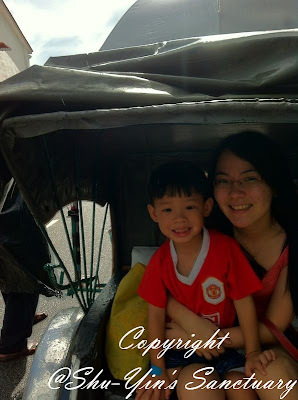 Look at his happy face while in the trishaw! 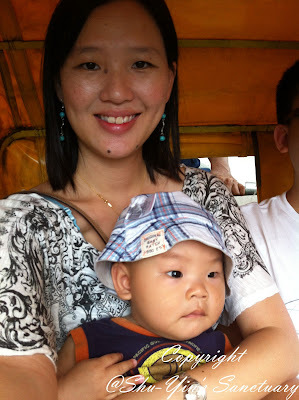 Another photo of me and my cutie pie. 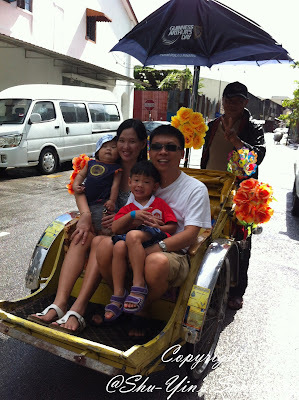 The trishaw man helped us take some photos of his passengers. And then Shern joined us for a family photo. We did not manage to stop at the few requested stops due to rain. So it was a really fast ride. Totally not worth the money in terms of journey. But in terms of happiness for my kids, it was quite worth it. 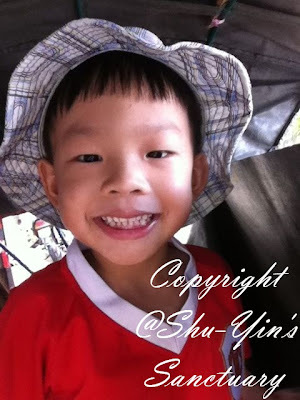 Shern was happy. Khye is still too small to know anything. He goes happily wherever we go. Lol. And once the ride finished, the rain stopped. Apalah! So we drove to the Step By Step Lane that we missed just now, and did what we wanted to do...take a photo with the kids on the swing! 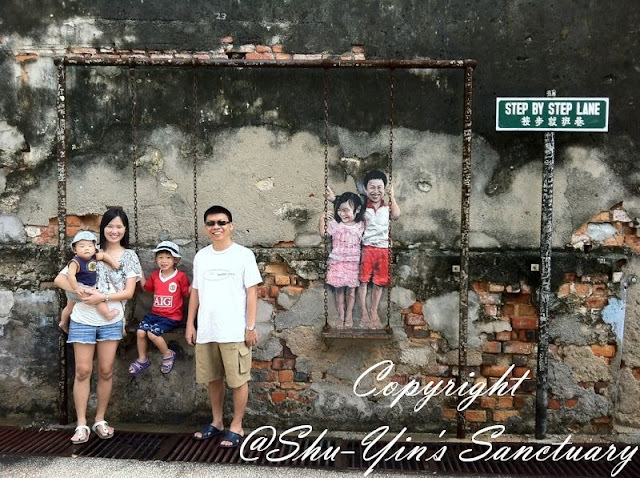 So let me end this post with a photo of the 4 of us with this beautiful mural of the kids on the swing! 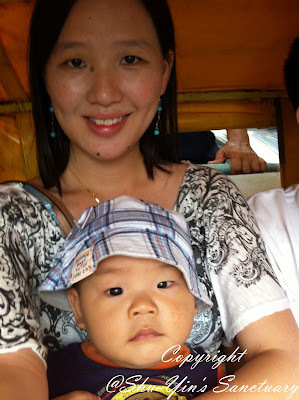 I'm so glad to have brought my kids on a trishaw ride.